I noticed a little detail the other evening while I was out and about in a bit of a snowstorm. It was a Tuesday at about 21:00ish. 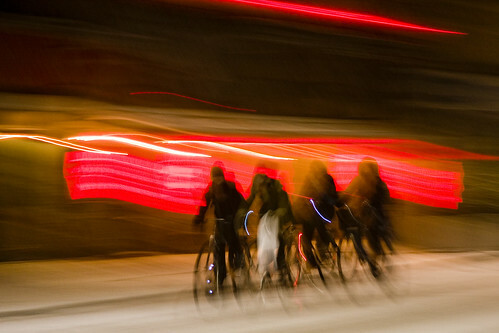 Perhaps fewer cyclists than average, what with the snow and wind, but still many on the streets. Normally when a cluster or crowd of cyclists gather at a red light it doesn't take long for them to spread out once the light turns green. The different tempi of the different people means that the clusters are dispersed. In the heavy rush hour bicycle traffic it's a bit different. A larger school of fish swimming together. But in smaller groups it's more noticable. 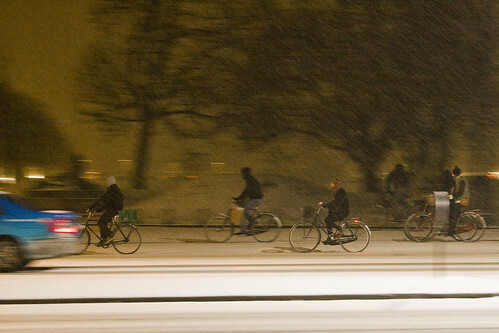 What I noticed that evening was that many cyclists were sticking together on many stretches of snowy bike lanes. Simply a variation of the Safety in Numbers concept. It's slippery so you slow down but sitting behind other cyclists perhaps makes it feel safer. The head of the pack carves a route and the other follow along. Unplanned and spontaneous. I doubt that drafting was the sub-conscious reason. You don't see that much in the city. 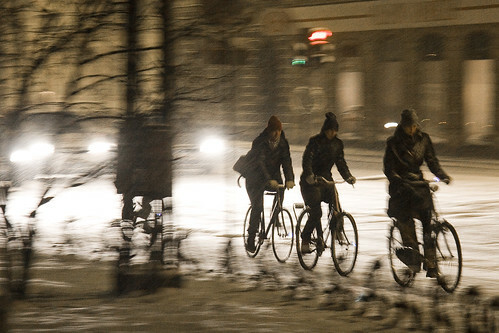 Just some people on bikes forming safe little groups in the adverse weather. Helping each other along without really being aware of it. I like that.